For dads who often need to carry a small child (around 2 years old or younger) and who also need a small child backpack product for diapers and child essentials, you may consider a backpack kid carrier, like the Kelty or the Deuter Kangakid. Kelty and Deuter are both top brands in the child backpack product and outdoor gear market, so unsurprisingly, both packs are excellent quality. They are well-constructed and planned for carrying small loads as well as a child. Both these child backpack products bill themselves as daypacks that convert into child carriers, but we doubt anyone would want to carry the extra load of the child seat unless they have a child who needs to be carried periodically. Both these child backpack products come in one attractive color selection and do their job well. Your choice will come down to how much you need to carry today, how much you can deal with the basic weight of the pack, and how much you are willing to pay. A perfect solution would be to buy the Deuter when your child is younger, moving on up to the Kelty when you need the weight limit. If you only have to buy one child backpack product, the Kelty is the more versatile pack, one which will grow with your child a bit longer, or until you can no longer bear the weight of a 40lb load on top of a 6.5 pound carrier. Remember: These child backpack products are only for kids who can sit up straight themselves and you have to always be aware that prolonged sitting can cut off circulation to the child’s legs. Description: This multi-functional child backpack product quickly transforms into a child carrier when your young explorer gets too tired to walk on! It is super compact, so it’s ideal when space is tight. Description: This simple and versatile child backpack product can be used as your everyday pack or converts to a carrier when you need it. 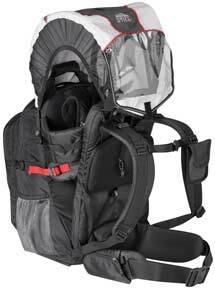 This is the top of the line Kelty carrier, and is made to come with all the bells and whistles instead of offering these extras as add-ons (sun/rain hood, changing pad, child-view mirror and removable kid pack/diaper bag).